The origins of Tivoli date back to more than 3000 years ago and its history is important and rich of myths.During the classical age, the city of “Tibur” has been defeated and absorbed by the Roman Empire, an event that gave rise to a series of architectural additions, the most known of which are the Villas, like the UNESCO World Heritage “Villa Adriana”. Also the succeeding Middle Ages and Renaissance have been turbulent times that tell us of wars, sacks, clashes for dominion, but they left us some treasures too, in the form of castles, cathedrals and a unique example of italian art, as is Villa d’Este. Villa d’Este rises on the west side of mount Catillo, an optimal vantage point to enjoy some scenic views of the surrounding flat countryside, especially at sunset. 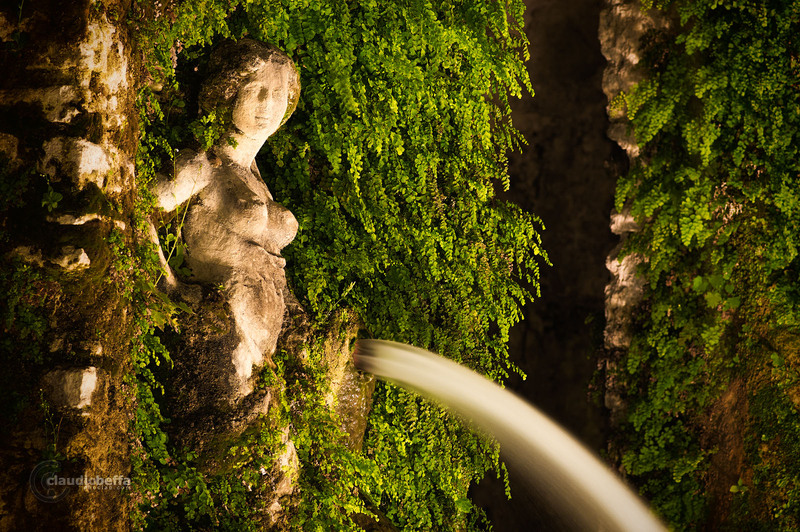 But the real protagonist is Villa d’Este itself: it’s such a beautiful form of human craftsmanship and art that has been designated as World Heritage by UNESCO; the palatial complex and its terraced gardens represent one of the most outstanding examples of Renaissance culture at its apogee. The gardens, in particular, have been devised so much brilliantly that they have deeply influenced the development of garden design all over Europe, becoming the symbol of flowering Renaissance. There are two things that I’ve found definitely amazing: the first is the incredible number of fountains positioned along every promenade and terrace, for a total of about five hundred water jets; there’s no place in the entire complex where you can’t hear the sound of gushing water. 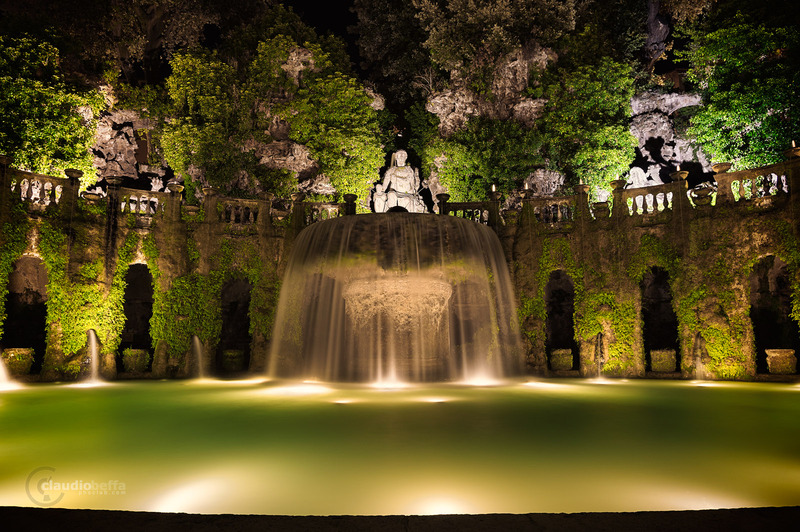 The fountains themselves are wondrous and their water games are mesmerizing: everything contributes to estrange you from the world outside the garden (maybe this is the reason of the name “Giardini delle meraviglie”) and in my case this effect has been amplified because I had the chance to shoot the fountains of Villa d’Este by night. After the sunset the garden turns into a magical and mysterious place where, while walking along a barely lit path, the muffled sound of flowing water attracts you to find out from where it’s calling: all of a sudden a water nymph appears before your eyes from a green wall of verdant leaves, pouring from her amphora a silky stream of water. Many other beautiful sights are accurately placed in the gardens, such as the Hundred Fountains , so as to make this “sensory play” a unique experience. The second thing that stroke me is more technical than emotional and I think that it can interest you too: it’s the method that has been developed to supply water to the great number of fountains, water jets, cascades and pools (as well as to irrigate the 45 thousands plants and trees arranged inside the 35 thousands square meter wide garden). 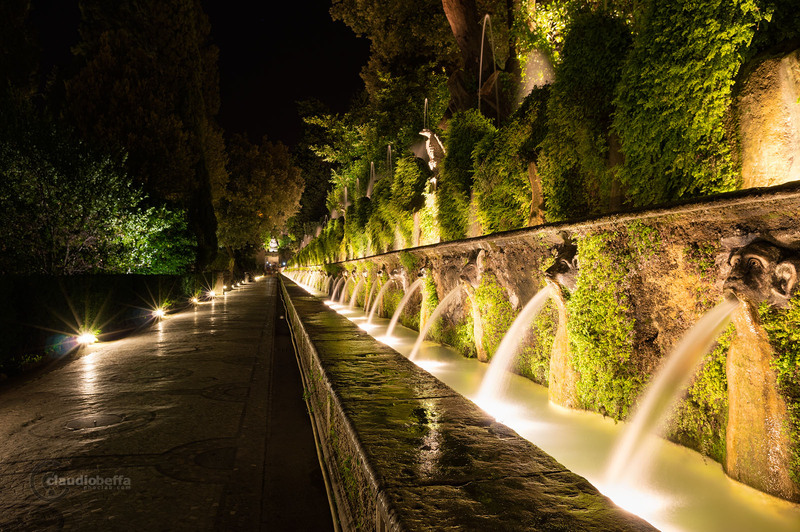 A complex supply system draws water from the Aniene river, brings it to a sort of catch basin through a conduit that runs below the city of Tivoli and, finally, feeds every part of the garden. What makes interesting this system is that there’s no use of electric pumps or any other modern device: everything works thanks to the rule of communicating vessels and this ingenious system pumps as much as 300 litres per second. I find it a brilliant example of italian Renaissance engineering and the result is striking even to this day.